It's time for another Kate Middleton post! I honestly can't get enough of her style! I've always been such a fan of her casual looks, especially when she's sporting one of her many styles of blazers. I love how she sticks with classic styles that she must like and feel her best in. She's never too risky with her fashion, which some people may criticize her for that, but I respect her for her classic looks. My closet has slowly taken a transformation in the past couple years. I have slowly added new pieces to my wardrobe, so that I can recreate and wear some of my favorite Kate Middleton looks. 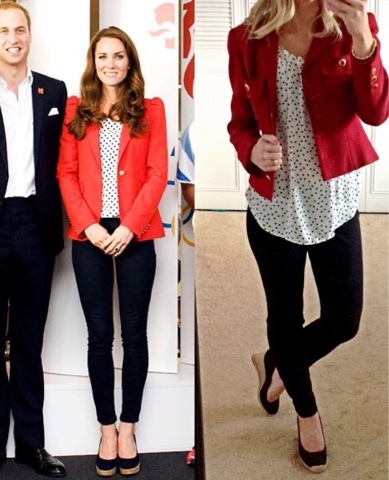 I've always loved Kate Middleton's blazers that she wears so often when she dresses down. I now can say that I have quite a collection of blazers myself. 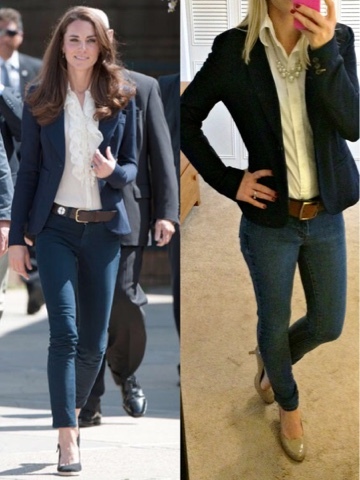 Here are a few of my favorite Kate Middleton blazer looks that I have recreated on my low budget. For my first outfit, I recreated this look that the Duchess wore on her and Prince William's 2014 Australian tour. 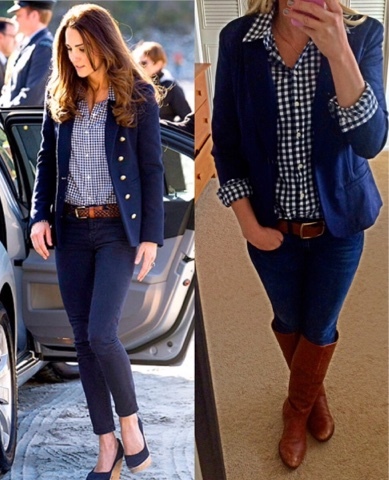 I wore my navy blazer (similar), dark jeans (similar) and gingham button down (exact), all are from Target. I completed my look with a pair of brown boots from DSW. For this look Kate is in a red blazer with a polka dot blouse. I wore an Ann Taylor blazer that was a hand me down from my mom. I also wore my polka dot blouse from LC Lauren Conrad (exact) along with my black Jessica Simpson jeggings (similar) and my Target black wedge shoes (similar). This look was from one of Kate Middleton's first public appearances after she gave birth to Prince George in the summer of 2013. She of course looked great in this green wool blazer with a blouse, black jeans and black wedged shoes. I recreated the look with a Banana Republic wool blazer, which is another hand me down. I wore my LC Lauren Conrad polka dot blouse (same as above) with my Jessica Simpson skinny jeans (similar) and my Target black wedge shoes (same as above). This last look is another favorite Kate Middleton look of mine. She wore this on her Canadian North America tour in 2012. She has her favorite navy blazer, a ruffled blouse with her wedge shoes. I wore my navy blazer (same from above), jeans (similar), a simple button down blouse from New York & Company (similar) with my beige heels (similar). What are some of your favorite Kate Middleton looks?